Listen to Neil and Leah chat about their nicknames from the show this morning. I actually had two nicknames. Babe was what my dad always called me, he would called me that until I got to be in my 20’s. I loved it, it may sound weird but it was actually very sweet. My other nickname was the one my friends would call me and that was Pebbles. I used to love to have my hair up in a very high ponytail as a little girl. 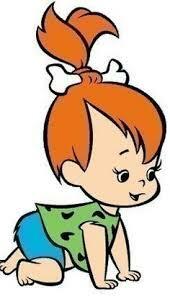 If you watched the Flintstones’s you know that Pebbles was Fred and Wilma’s little daughter who had her hair in a high ponytail but she had a bone in her hair, of course it wouldn’t have been okay for me to have a bone so I had to use a scrunchie. Those were just a few too many.